About a month ago, I decided to redo my home office. You can check out the mood board here. The room before was brown, dark and dreary. I wanted to lighten the space up. I also have a problem with putting holes in the walls. They were everywhere. I told the husband that I won’t put anymore holes in the walls. I didn’t promise. We painted the room a light grey and bought all white furniture. The only light that comes into this room is from one window, so I wanted it to have a light and airy feel to it. We had the one desk from pottery barn, and decided to get the rest of it. Sidenote: I bought the desk, and wouldn’t you know it — 2 days later I got an email saying they were having a 30% off sale on the exact desk I had just bought. I called customer service and asked if they do anything for customers in that situation. THIS is the reason that I buy things from Pottery Barn — the woman answered “Absolutely! We can reimburse you for the difference in the price.” Boom! We found these chairs at Target for a good deal, and this rug pulls the room together perfectly. If you remember back to Maddie’s Room Makeover, I found this shelf at IKEA and used 2 of them in her room. I loved it so much, I decided to get another one for the office. All of the floating shelves are from IKEA as well. When I bought the white chair for Maddie’s room, they came as a set. I used the other one for in here, and I think it’s perfect! What do you think? 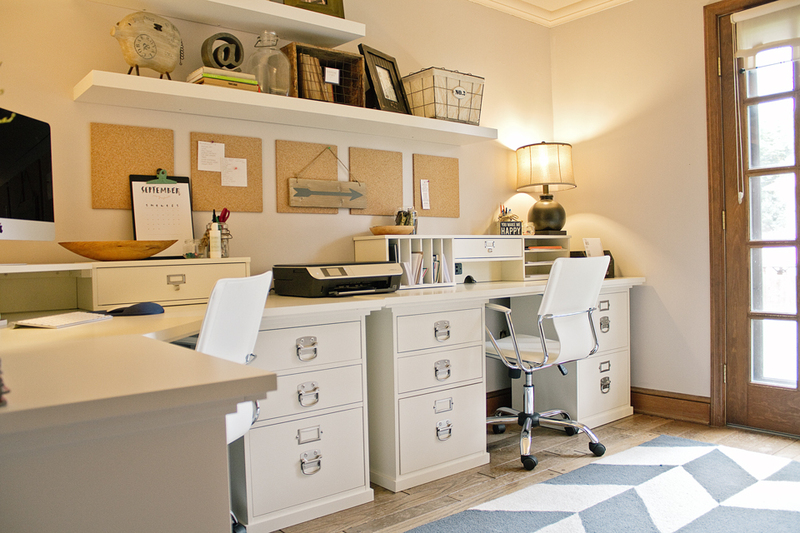 Are you thinking of making over your home office, or recently did? I would love to hear about it!